Since the 2016 election, women have been mobilizing at unprecedented levels: running for office, making their voices heard on the issues they care about, and demanding change. However, the 2018 Fortune 500 List reported that just 24 companies were women CEOS and that number is down 25 percent from last year's record-breaking 32 female CEOs. Don't miss this powerful presentation by one of Massachusetts top women leaders as she discusses strategies to increase diversity and female representation in business, academia, and politics. 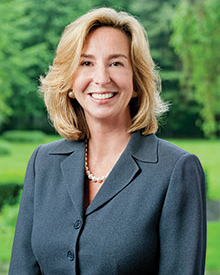 Dr. Kerry Healey became the first woman president of Babson College in July 2013, following nearly three decades of service in academia, government and humanitarian work both in the United States and internationally. Under her leadership, Babson has strengthened and expanded programs, increased access and affordability for students, and elevated the College's profile globally. Kerry has led Babson to its 25th consecutive No. 1 ranking in entrepreneurship while adding recognitions such as the No. 1 school for international students and the No. 1 private business school for return-on-investment. Prior to Babson, Healey served with distinction as the 70th lieutenant governor of Massachusetts.